What does a roots blower do? Roots blowers are used to generate constant airflows that are independent of discharge pressure conditions. Root blower applications are limited to low and medium pressure and vacuum processes and can be used to provide small to large airflow rates. How does a roots blower works? Roots blowers consist of two identical and symmetrical rotors that have two or three meshing lobes inside an airtight case. The case is valveless and has inlet and outlet ports that are generally on opposite sides. The rotors counter-rotate and are synchronized using a set of gear wheels. 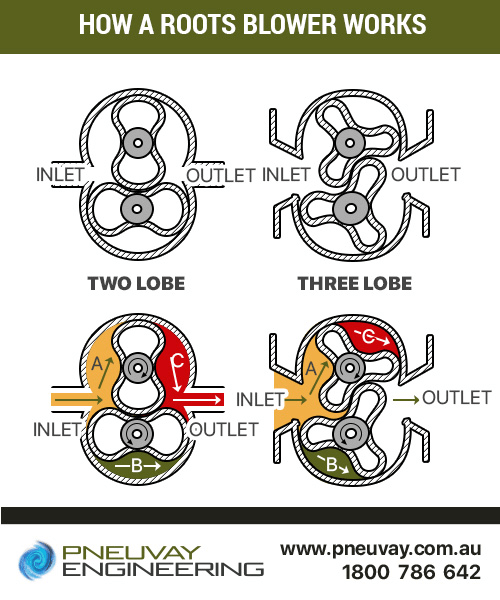 Air is displaced from the inlet to the outlet by the motion of the meshing lobes on the counter-rotating rotors. The rate of airflow from the displacement is governed primarily by the rotational speed of the rotors within the roots blower. There is no change to air volume within the roots blower, so no air compression takes place. Roots blowers are generally air-cooled and some models operate without the need for oil as a lubricant (oil-free). Read up on how to choose the right roots blowers or how to increase roots blower efficiency. What industries have roots blower applications? Raw meal, cement, kiln dust, limestone and coal powder are pneumatic conveyed using roots blowers. They are used to blend raw meal, aerate raw meal and cement and blow air into kilns and burners for combustion. Many cement plants generate their own power using a coal-fired power station. Refer to the power generation section to see how roots blowers are applied in that industry. Roots blowers are used to transport or compress many inert, corrosive and explosive gases in chemical plants and refineries. These include gases such as nitrogen, hydrogen, chlorine, and various combinations of hydrocarbon gases. Roots blowers are used in regenerative drying systems to provide ultra-clean and dry air. Bulk dry raw materials, such as aluminum oxide, are pneumatic conveyed using roots blowers on gantry ship unloaders and barges. They are used in pressure and vacuum modes in fixed and portable systems. Roots blowers are used to aerate raw sewage and industrial organic waste. The aeration drives the digestion of the waste by microorganisms. Roots blowers are also used for grit tank cleaning, filter flushing, backwashing and the recovery of gases. Oil-free roots blowers are used for deep cell aeration. Biogas is referred to as 'digester' or 'landfill' gas. It is made up of methane with small amounts of hydrogen sulfide and other trace gases. Biogas, which is explosive and corrosive, is generated in wastewater treatment plants. Roots blowers are used to transport biogas to where it is burned off or recirculated to fuel combustion engine-driven machines. Remediation of soil is done when cleaning up accidental spills from vehicles transporting petroleum products and industrial solvents, or leaks from fuel storage tanks. It involves the extraction of volatile organic compounds such as hydrocarbons and solvents. A combination of pressure and vacuum systems is used to evaporate these volatile organic compounds by moving large quantities of air through the contaminated soil. The contaminated air is then processed to remove the hydrocarbons and solvents and allow safe and immediate exhausting into the atmosphere. Oil-free roots blowers are used to provide air for ozone production and filter flushing in drinking water purification systems. Oil-free roots blowers are used to supply air to many food processing and pharmaceutical manufacturing processes. Note that beverages and poultry are included in food processing. Vacuum and pressure pneumatic conveying is used to transfer powder and granular materials such as flour, salt, sugar, grain, spices, chocolate and milk powder for food processing. Dry bulk chemicals are similarly conveyed in the production of many pharmaceuticals. Roots blowers are used to supply vacuum equipment that operates packaging machines. It is common for food and pharmaceutical plants to have large wastewater treatment systems used to decontaminate processed water and treat organic waste. Refer to the environmental section to see how roots blowers are applied in that industry. Roots blowers are used in marine diesel engine supercharging. They are also used to provide an air supply to bubbler systems on icebreaker and other Arctic duty vessels. They pump inert gas for fuel tank blanketing in tanker ships, and power emergency steering and braking systems on ships. Roots blowers are used to load and unload dry bulk material ships and barges with pneumatic conveying systems.&amp;amp;nbsp; Cruise ships and military craft with large numbers of passengers or crew operating on board have the aeration process within wastewater treatment systems powered by roots blowers. Marinas, locks and harbors use roots blowers to drive air bubbler systems to ensure equipment will operate at sub-zero temperatures. Roots blowers are extensively used in the mining of most minerals, including copper, nickel, gold and diamonds. They are used to pneumatic convey dry bulk materials and provide air for oxidation processes and other refining applications. Roots blowers are used to filter and dry slurry and power high capacity vacuum pumps. Many mines have large wastewater treatment facilities to allow for the decontamination of processed water, a process requiring roots blowers for aeration. Roots blowers are used for material handling and pollution control processes throughout the power generation industry. They are used to pneumatic convey fly-ash and lime in both vacuum and pressure modes and are an important part of flue gas desulphurization (oxidation). Roots blowers are used to transfer various bulk dry materials to and from trucks, railway cars, storage silos and hoppers. 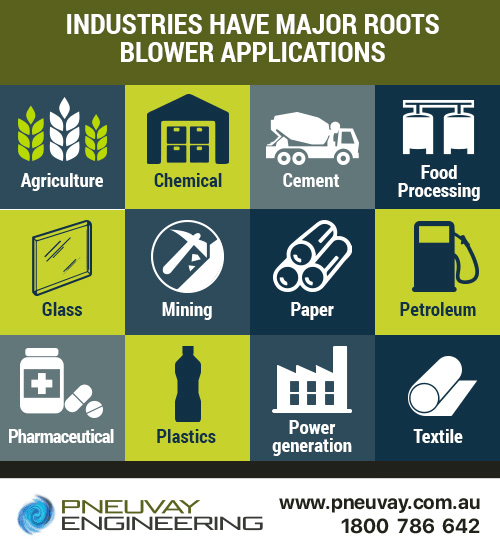 Pneuvay Engineering has more than 30 years of industry experience in using roots blowers within pneumatic conveying, vacuum transfer and dust control systems in Australia and around the globe. Contact us if you need assistance or have some questions regarding roots blowers within these systems.